I am frequent visitor at our local library. 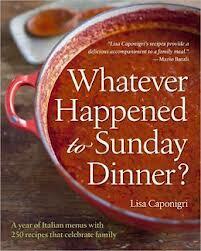 Usually, I have a list of books on my to read list and I stick to that list, but occasionally a new release on display will catch my eye, as was the case with this cookbook, "Whatever Happened to Sunday Dinner?" I love my Italian food loving family that gathers round my mom's dining room table each Sunday so this book was right up my alley. It seriously doesn't feel like a Sunday if we aren't eating a big midday meal at my parent's house. My siblings and their spouses and kids all come and it is a good loud time with good food. Today's recipe comes from this book. It is listed in the cookbook as Veal Saltimbocca, but I prefer chicken. Feel free to choose your preference. It is a perfect summer meal for me since I have a huge sage plant growing in my herb garden. Cut your chicken breasts into thinner pieces by using the method shown in this post. Place each piece of chicken in a big ziplock bag (or between two wax paper). This makes the piece thinner and easier to roll, as well as tenderizing the meat. Set up your pounded chicken pieces on a cutting board, assembly style. Place one slice of prosciutto on each chicken cutlet. And roll it up, jelly roll style. Secure the roll with a toothpick. Now melt the butter in a large skillet over medium high heat. In a bowl, salt and pepper about a cup of all purpose flour. Coat each rolled chicken piece in the flour. Brown lightly on all sides, until chicken is cooked through. Remove the chicken from the pan once cooked and place on a brown bag or paper towels. In the skillet, add your wine or broth to the hot pan. Use a spatula to scrape up all the little bits on the bottom of the pan. This is where all the flavor is! And now you have a delicious sauce to serve over your saltimbocca. Plate your saltimbocca, removing the toothpicks if you would like. Pour the pan sauce over the saltimbocca. See that lovely spiral of prosciutto, chicken and sage? It was a delicious Sunday dinner meal (but we actually ate it on a Monday, don't tell). I loved the ease of preparing, and the pretty presentation. You can also make the chicken roll ups (don't roll them in flour though) earlier in the day and leave covered in the fridge until you are ready to cook them. Did you know that Saltimbocca means "jumps in mouth?" This tasty dish certainly will!